While many people prefer the art of natural surroundings to something man-made, there is increased evidence—not all anecdotal—that being able to likewise enjoy a piece of art away from the standard four walls of a museum or gallery is a growing trend. Last year, the Ketchum Arts Commission realized a long-held dream of seeing art veneers on utility boxes, which can be seen scattered about town. This week, esteemed public artist Jack Mackie—well known in the worlds of planning, design and construction of civic space and structures—will give a free lecture on “The Art of Making Places Public,” at 6 p.m. Thursday, May 9, at the Community Library in Ketchum. McCain encouraged anyone with an interest in art, artists, advocacy or who is a patron of the arts to attend the event. The commission, a division of the Ketchum Parks & Recreation Department, receives support from the Ketchum Community Development Corp. It is made up of volunteers who are active in and passionate about the arts. It was created by the city of Ketchum in 2009 with the objective of integrating arts and culture into the community. Mackie has worked with communities and organizations of various sizes around the country. He has co-authored the Public Art Plans for Scottsdale, Ariz.; Broward County, Fla.; the Memphis/Shelby County Library system; Dallas Area Rapid Transit and many others. 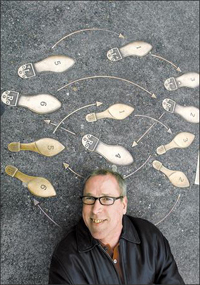 As a working artist, his commissions include works for the Health Sciences Learning Center at the University of Wisconsin; “Dance Steps on Broadway” in Seattle; “Seats & Gavels,” at the Scottsdale Arizona Justice Center; and “Trillium Patch,” at the Norfolk, Va., light-rail station. He currently serves on the Public Art Review Advisory Board and as Creative CityMaking Initiative Advisor to Intermedia Arts and the city of Minneapolis Planning Department. Trina Peters, who serves on the board of the Sun Valley Center for the Arts, said Mackie has been doing his homework on the valley and will also spend time here speaking to various organizations and city government staffs. In addition to creating the commission, the city of Ketchum has enacted a 1 percent for art ordinance, initiated the Cover Art project, the Art on Fourth sculpture exhibit, and the installation of Kagan Park by the Wood River YMCA. When: Thursday, May 9, at 6 p.m.